[Resolved] How to Convert M4V to MKV with Smart Work? HD Video Converter - Ultimate Video Converter. As an iPhone or iPad user, you must have faced this problem that you can’t play your M4V video files on Android Phones or on TV. You’d better learn about this article to transfer M4V to MKV for playback on your portable devices. The best ever WonderFox HD Video Converter Factory Pro meticulously helps you to convert M4V to MKV with the fastest speed and high compression. Quality: M4V and MKV both support H264, and both support HD video so they are about the same quality. Compatibility: MKV>M4V, M4V can only be used in IOS, iPhone or iPad. 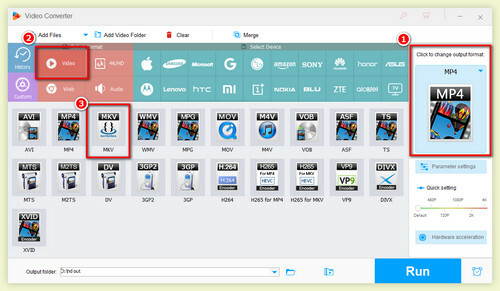 While MKV can hold an unlimited number of video and audio on any computer or device. Plus, it provides the native language and subs. Typically, MKV has a better compatibility to be used in home theater, it’s necessary for you to transfer M4V files to MKV for private use. WonderFox HD Video Converter Factory Pro is the best M4V to MKV converter which provides the shocked video compression speed and it is designed to optimize your computer performance of 50X conversion speed with the support for Nvidia NVENC, CUDA and Intel QSV hardware acceleration tech. Meanwhile, it works quite well to reduce memory requirement and can downsize video (convert HD video to SD video) with minimum quality loss. This professional Video Converter is the best choice for us to solve the video format compatibility of Apple devices. As an All-in-one video conversion software, it also supports iPad, Mac Book, Android, Tablet PC, and more other devices. Moreover, this converter is super easy for all users converting M4V to MKV. Just a few steps, you could complete the conversion. In order to transfer M4V MKV, you need to Download WonderFox HD Video Converter Factory Pro. Then, launch that software and click ‘Add Files’ button to load your video. Or you can just finish this step by dragging your file to the software. 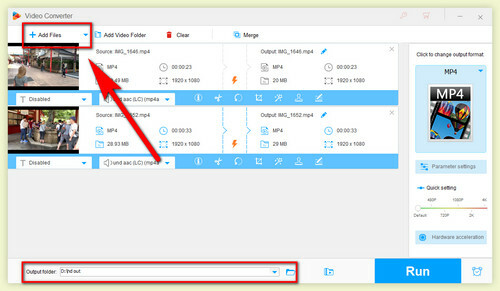 Tips: WonderFox HD Video Converter Factory Pro also allows operation in batch process, you can squeeze your video in it and they’ll be converted simultaneously. 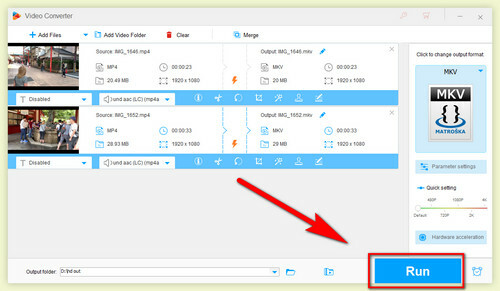 After you finish the first step, please click ‘Output Format’ button, you’ll see a list of different kinds of formats of this M4V video converter. And then choose MKV as the output format. Next press the Folder icon to choose the output path. Tips: Please notice that there is no need to change any advanced settings if you use it for the first time. This amazing software has already loaded optimized defaults for you. If you are really interested in customer settings, you could read more articles about change aspect ratio, change video resolution, merge video with lossless quality. In addition, WonderFox HD Video Converter Factory Pro is not only just an M4V to MKV video converter, it also supports other kinds of formats such as M4V to AVI, M4V to MP4, 3GP to MP4, MP4 to MKV. Then, click ‘Run’ button, this magical software would perfectly convert your video with thundering speed and lossless video quality. Tips: Before conversion, users are able to modify advanced setup such as cut any video, find out the simplest way to make a ringtone, video filter, boost audio volume. WonderFox HD Video Converter Factory Pro is designed to be as easy to use as it is simple to look like. Please enjoy it and bring home true-to-life picture quality. Furthermore, it can help you compress 4K UHD video and reduce video file without quality loss. Moreover, a built-in online video downloader allows you to download video and archive them on your device. All in all, if you want to watch movie in home theater, MKV is a best choice for you to convert, which is an open standard, free container format, a file format that can hold an unlimited number of video and audio. Under the comparison with M4V, as the advantages of MKV, it supports expanded audio codes, which allows you to freely share video with your friends.